This rectangle cocktail table has an exposed wood plank top and metal base for a cool contemporary look. Transform the living space in your loft apartment or trendy home with this piece. Use the bottom shelf to hold decorative pieces, reading materials or leave it empty for a clean look. 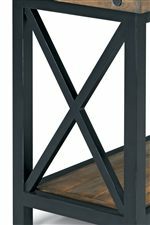 The metal base forms an X shape on either side and is finished to have an aged, industrial steel look. Use this piece with a contemporary sofa to transform your living space. The Carpenter Rectangle Cocktail Table with Exposed Bolt Heads by Flexsteel at AHFA in the area. Product availability may vary. Contact us for the most current availability on this product. Finish & Paint Options Reclaimed wood finished in a medium brown. 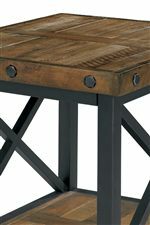 Case Detail Table edges feature exposed bolt heads while the bases are made from metal that have an aged, oiled steel appearance for an industrial look. Description: Top Wood planked tops. Case Construction Constructed from reclaimed wood planks and hand-worked metal frames. The Carpenter collection brings you contemporary, industrial occasional tables perfect for your loft apartment or modern home living space. Update the middle of the room with a rectangle or square cocktail table while the sofa table is perfect for an entryway or behind a sofa to display photos, decor and more. Use a rectangle, square or chair side table to fill the space between chairs or at the end of your sofa for a completed look in your room. With reclaimed wood planks on top of a metal base this piece has a modern and industrial look. Update your living space with the occasional tables from the Carpenter collection. The Carpenter collection is a great option if you are looking for Contemporary furniture in the area. Browse other items in the Carpenter collection from AHFA in the area.